Think a cable cylinder might be the best actuator to your design project? Well, which one do you need? There are rodless cable cylinders, guided cable cylinders, single acting cable cylinders, and linear tension cable cylinders. Some aspects of cable cylinders are the same regardless of model. But of course, there are differences too, and it’s those differences that can help point you in the right direction. You can get the full story by downloading our Cable Cylinder Catalog, which includes a selection guide and sizing worksheet. Here’s an overview to get you started uncovering the secrets of fluid power. provide value and have long service life. These designs deliver a lower cost per inch of stroke. They also offer greater design flexibility. You can mount the main body away from the work area simply by spec’ing extra cable length. And while all cable cylinders are intended to power externally-guided loads, you can choose the configuration that best suits your application by incorporating auto tensioners, reed switches, and/or caliper disc brakes for position holding. Cable cylinders are also field repairable. As with all automation components working in a production environment where line uptime is everything, we highly recommend keeping field repair/rebuild kits on hand for each model cable cylinder you’re using. But cable cylinders aren't all built the same. There are key difference in each kind depending on what you're using it for. Rodless Double-Acting Cable Cylinders apply power in both directions, by stroking along its body length. You can reduce your footprint by as much as half compared to a traditional rod-type cylinder because there is no rod to extend during actuation. 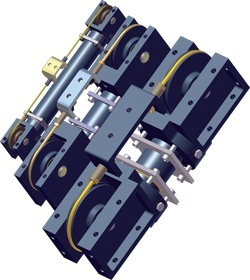 Guided Cable Cylinders are designed for self-guiding and self-supported loads, so they combine a double-acting cable cylinder with a pre-engineered/packaged guide and a load-bearing support system. Standard models use journal guide bearings, or you can spec linear ball bearings instead. Single-Acting Cable Cylinders are designed for vertical or horizontal lifting. These cable cylinders are ideal for applications such as opening doors or gates, articulating arms, lifting or raising items, and counter-balancing. They are affordable, especially compared to double-acting cylinders. Linear Tension Cable Cylinders are designed for direct linear tensioning (especially for short stroke applications) and counter-balancing — a great alternative to pneumatic rod type cylinders because they cost less without reducing quality. If you’re not sure which cable cylinder to use for your application, we at W.C. Branham can help. Our design and engineering folks love to answer questions about our products. We can help you puzzle a design conundrum or spec exactly the right product, whether it’s a cable cylinder or something else.